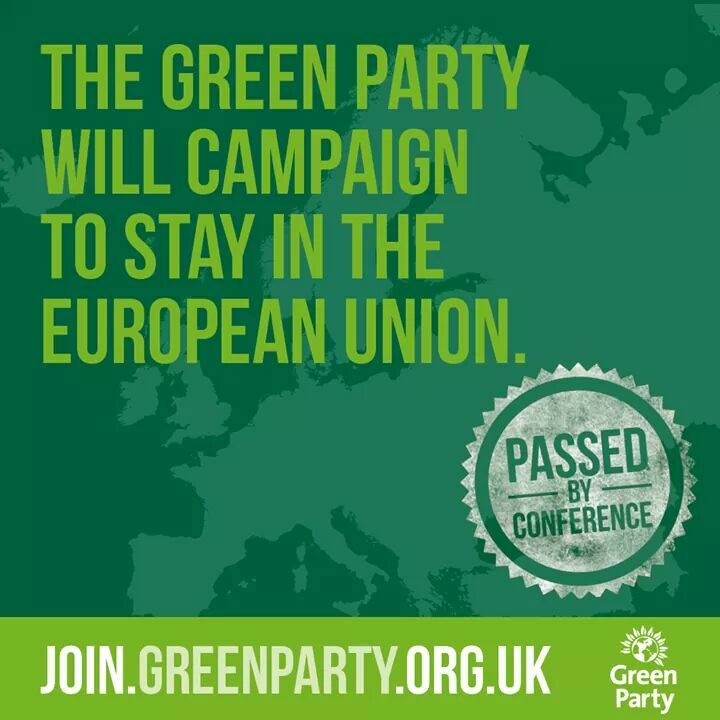 Greens and the EU – a cautious yes. It’s safe to say that EU membership is a contentious issue which led to a lot of debate at this weekend’s Green Party conference. I was very much on the fence when I went but, despite big reservations, have come back mildly in favour of staying in. Admittedly that’s more through being terrified of what would happen if we came out rather than any particular confidence in the current set up. The EU as it currently stands is neoliberal – it puts big businesses before small and profit before people. However, the same is true of our own government. Leaving the EU wouldn’t give us a reprieve from TTIP (the Transatlantic Trade and Investment Partnership trade deal – see the video at the bottom of this post for more information). If anything it would leave us with fewer protections. Our current government loves TTIP and is one of its strongest proponents in the EU. Our current government has also opted out of the EU transaction tax (Robin Hood tax) and greater tax transparency. David Cameron is likely to try to negotiate away some of the better things about the EU, such as environmental protection, employment rights and freedom of movement. If he succeeds staying in the EU will seem like an even less attractive option but the alternative doesn’t bear thinking about. The EU needs massive reform. It’s not as undemocratic as many believe it to be: the European Parliament is directly elected; the European Council, itself made up of heads of member states (in our case, David Cameron) proposes the candidate for the European Commission’s President who then selects the European Commission’s members. All of these decisions have to be agreed by our MEPs. The problem isn’t an undemocratic system: the problem is that we keep on electing the wrong people. From support for farmers to investment in town regeneration; from animal welfare to the working time directive; from air pollution legislation to food standards there are many good things which we have the European Union to thank for. If we leave we’ll be throwing the baby out with the bath water. The Transatlantic Trade and Investment Partnership is being negotiated in Europe behind closed doors. It could reduce European standards to those of the US. Leaving the EU would be very unlikely to protect us from it. It should be headline news but has been buried.